Lille plays host to the oldest and largest Christmas Market in Northern France and is a great place for your students to experience the unique atmosphere of a European city at Christmas. With the convenience of Eurostar this modern continental city can be reached in less than 2 hours from London, making it ideal for a day trip or overnight stay. 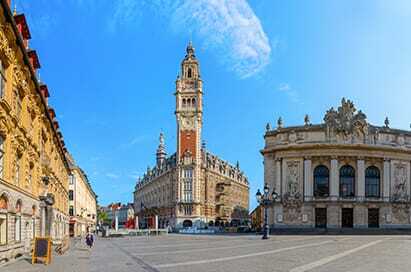 A sightseeing tour of Lille will offer your group the opportunity to see the city's main attractions. A professional, experienced, English-speaking guide will give an insight into the history and culture of the city and will be able to answer any questions you may have. A superb shopping centre that no visitor should miss. With nearly 200 shops, both big and small, you'll find a range of goods and services to satisfy any requirement. When you fancy a break from shopping, you'll be spoilt for choice, with 30 places to eat and drink. The Vert Bois domain at Bondues stretches over 30 hectares. It maintains a cultural current through its temporary shows and the permanent exhibition of its works of art. The castle's 18th-century interiors constitute a real museum of decorative arts, with furniture of outstanding quality, taste and charm. The foundation, the park and castle can be seen throughout the year. The forum aims to foster the pleasure of discovery in science and technology by setting them in the context of contemporary life. Science without tears through exhibition halls, a cabinet of curiosities, a planetarium and a section for the young.